If your child has recently been diagnosed with autism and you are interested in enrolling your child at AEIOU, you are in the right place. 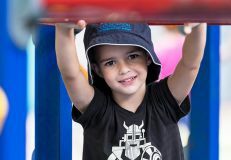 To find out more about the benefits of early intervention and how AEIOU Foundation can support your child and your family, please call our Parent Liaison Coordinator on 1300 273 435 or email enrolments@aeiou.org.au. AEIOU Foundation offers a caring, nurturing environment for your child and your family. Your child will receive therapy and education support with an emphasis on kindness and compassion, and you will receive the support and training you need to meet your goals at home. AEIOU is an NDIS-approved service, and is recognised for delivering a quality service which offers good value for money. 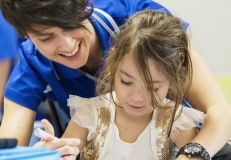 For details of our early intervention service, our curriculum, and our transdisciplinary approach, click here. All AEIOU Foundation centres welcome visitors interested in finding out more about our early intervention service to the centre open days, held throughout the year. To find out when the next open day near you will be, please check our calendar. At AEIOU, we strive to ensure our service is affordable and accessible to all families. You can find information about our fees here. For a tailored quote of your estimated fees, please contact our Parent Liaison Coordinator today on 1300 273 435 or email enrolments@aeiou.org.au. Please note: submitting an interest in enrolment form does not guarantee a place for your child at AEIOU. Regrettably, a number of our centres in metropolitan areas have long waitlists for families wanting to access our service. We continue to actively lobby government at all levels to advocate for increased funding to ensure more places are available to the children who desperately need them. We strongly recommended you contact our enrolments office on 1300 273 435, who will be able to advise you on centre waitlists, including waitlist fees.